As we have worked in the carpentry and kitchen fitting trade now for 20 years we understand that the kitchen has become the focus point of the home. With more customers leaning towards open plan kitchens flowing into dining/living areas this is the heart of the home where families are spending a large amount of their time. Nowadays kitchens are increasingly being combined with an entertainment area for an expanding family, This is why it is important that the new style and design of the kitchen reflects the multi-purpose needs of the modern family home. We can create your dream kitchen to make the best use of the space available and to maximise all features so your new space will be completely organised and of a very high quality. We will be able to utilise the space available to have maximum storage facilities and I can increase the working surfaces so there will be more room making everyday jobs easier. We can design and manufacture kitchens made from all types of wood product and natural timber or what ever materials the customer desires, we can also supply and fit kitchens bought from an external supplier. 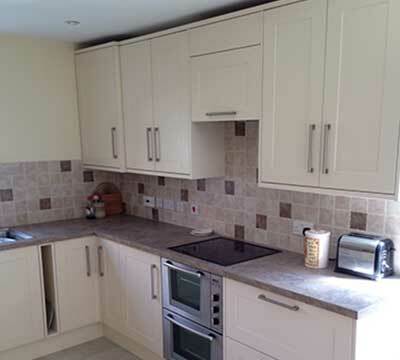 LA Carpentry will project manage your kitchen fitting so every aspect will be covered including plumbing, tiling, plastering, and all related installations and electrical work and your choice of worktop material. We can also source all of the integrated appliances such as Cookers, Freezers and Fridges to ensure the kitchen fitting is finished to the highest specification. If its a budget kitchen or designer, from traditional to contemporary, our wide network of suppliers allows us to find the best quality products with the best price for your new kitchen. We are quick working, professional and come with high recommendations from previous customers meaning you can be confident that the installation will be a hassle free process.